Who said that escaping from it all means going to the countryside? You also can relax and unwind in one of our many stunning city break locations, dotted around the UK in some of the country’s most scenic city spots. 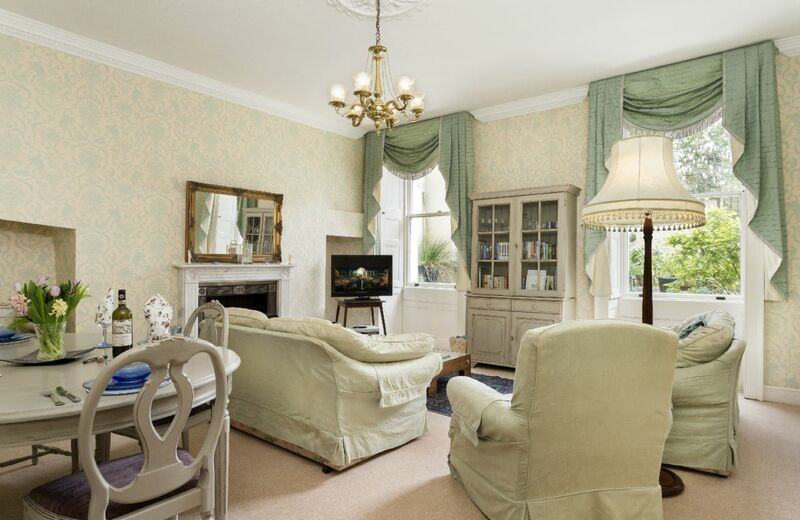 Whether you’re looking for an apartment to spend a quiet weekend in, or want rent a regency townhouse to take a bit of a longer break in, we have the perfect setting just waiting for you. Your search returned 4 matching properties. A lovely house in an ideal location. Superb attention to detail. The welcome hamper was excellent. We will certainly recommend it. Fantastic house in a wonderful location spotlessly clean all quality fixtures and fittings with an amazing welcome pack, what more could you ask for. The property is first class in every way and the situation overlooking the cathedral is superb. Beautiful, comfortable, well-equipped cottage in enviable position. Beautiful house very comfortable, central and easy to explore Wells, short walk to supermarket. We also thoroughly enjoyed being able to use the bus service to visit other areas of Somerset enabling us both to enjoy the countryside, and not worry about parking. This a beautiful home in a beautiful location. We would highly recommend it! everything we needed was there.the hamper was fantastic and views from the front window onto the greenabonus' only critism was readingthe map provided.but we are not good at maps.we would be happy to go again it is very special.wonderful recital in the cathedral. We love this home! The gorgeous location across the green from Wells Cathedral is matched by the lovely comfort and meticulously clean interior of this property. Every detail is anticipated and the house is so easy to relax in. It’s within walking distance of every amenity you could possibly want or need while in Wells. This may be our favorite Rural Retreats cottage - and we’ve stayed in many of them throughout the years. We can’t wait to return! Home from home quality. Very comfortable and wonderful location! Es war wieder alles sehr schön. A very well equiped and luxurious cottage. We especially appreciated the very generous welcome basket and all the little extras that made our stay so enjoyable. 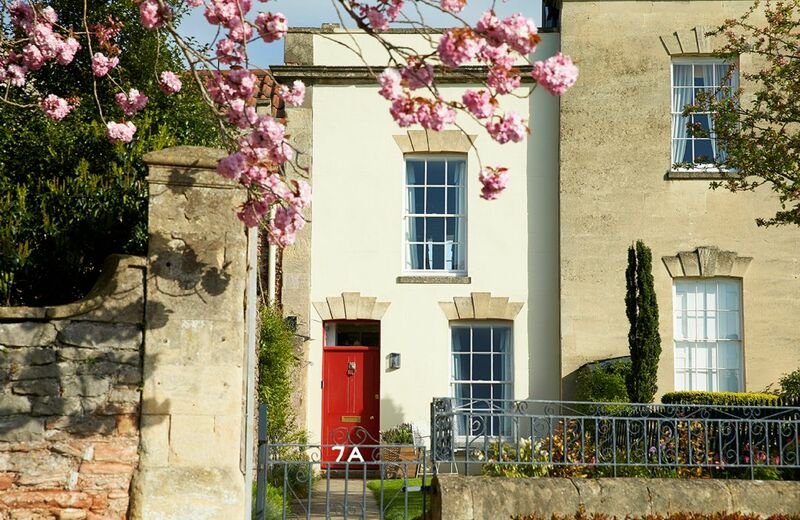 A very beautiful house in a wonderful setting overlooking the Cathedral in Wells. The house was very special. There are not many holiday let's that have a view of a cathedral. The decor, furnishings, cleanliness were 5 star. Never ever have we stayed in a cottage that not only provided a wonderful selection of food etc, but a basket of yummy chocolates was the icing on the cake. A well-appointed, comfortable house in the perfect location. The welcome basket was very generous with everything we needed to get started. Everything we have come to expect from Rural Retreat holidays. This time the situation of the cottage was especially charming and convenient. We hope to return sometime. Ideal location, high quality property with all our needs catered for. Perfect! A superb property well thought out and everything is top quality. The welcome pack is superb. Wonderful location and perfect house. Very happy indeed. A two bedroom, two bathroom picture-perfect house in the heart of a busy little city - the smallest in England. 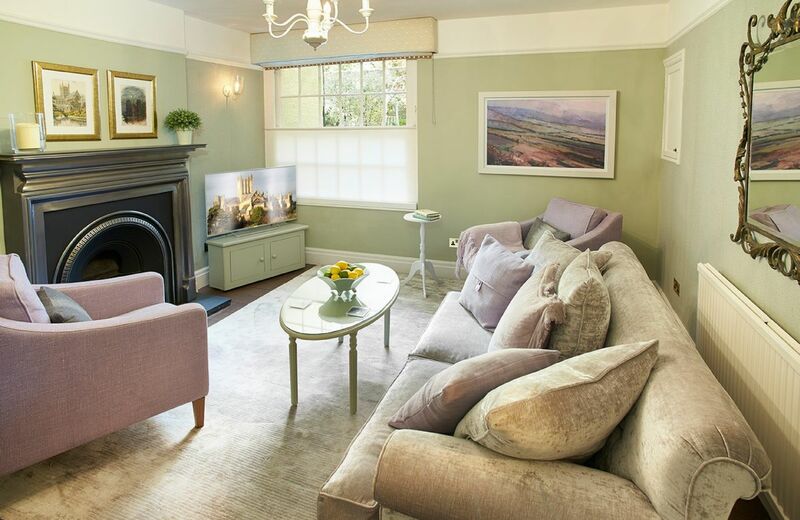 Dating back to the 15th Century this Grade II listed property overlooks the cathedral and has been refurbished to create a modern yet relaxing holiday home. Lovely flat but top of building! Location was brilliant - and the apartment very comfortable. I am very pleased to tell you that Wifi is now available at Catharine Place. The apartment was amazing and in a fantastic location for exploring Bath, it was really clean and the house keeper was really welcoming.. It's a home from home, with a good bar 50m away. 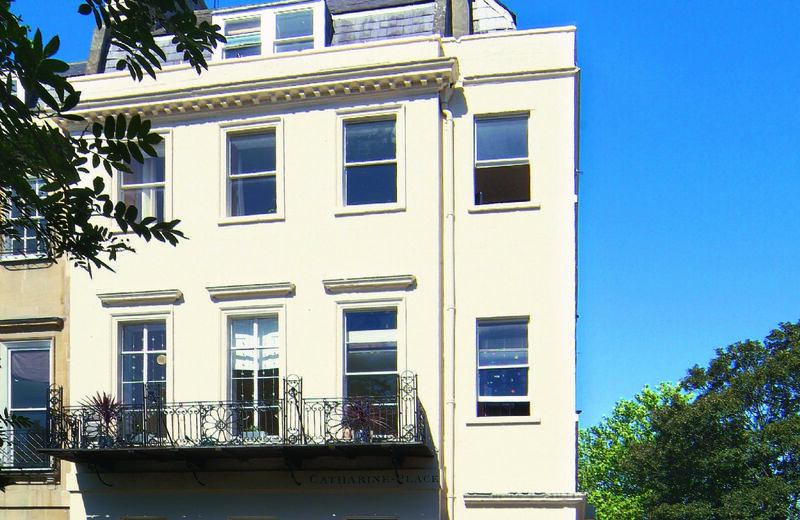 Very well-appointed and in a great location in Bath. Amazing apartment and Joyce the housekeeper did so much to make our stay perfect. The welcome hamper was much appreciated and all of the instructions and information beforehand was really helpful. I would actually rate the housekeeping service by Joyce, as excellent. However, our stay at Catharine Place, Bath was spoilt by disturbance from the flat above. Loud footsteps and creaking floorboards made a considerable impact on our sleep and ability to enjoy this beautiful, well situated property. Because of this, we will not be returning. Big shout for Joyce who couldn't have been more helpful. Thank you. Very good property in the heart of Bath. No excuse to not have wifi in the property these days. This was below the usual Rural Retreats standards. Bed wasn't very comfortable, some maintenance issues needed attention, including dangerous mirrored intrusion in hallway and peeling wall paper. Very hard to collect keys through housekeeper, who didn't answer the phone but always called back. Wifi is essential now, not an option. The commercial BT alternative is expensive and unreliable. Supply wifi as others do, even if it means charging a little more per night. Everyone else does that. Due to the many stairs anybody who is disabled would not be able to access the place. I don't think that was on the literature. Fortunately the stairs made us fitter! But what a pleasure the apartment was. 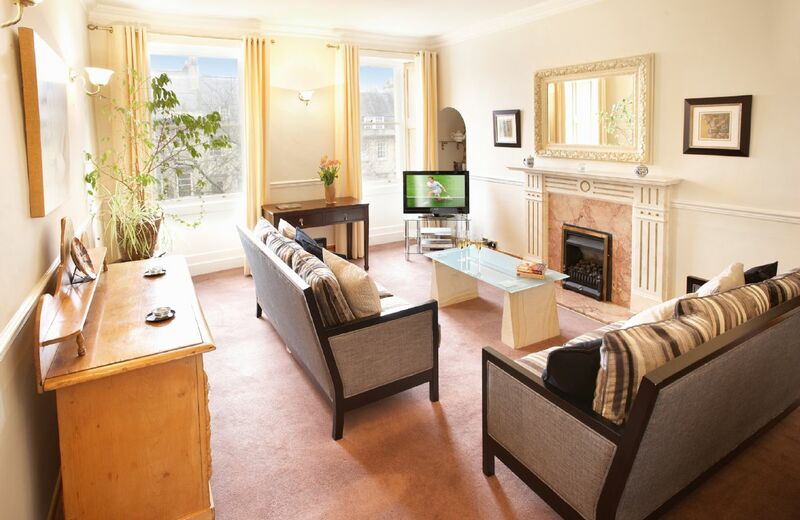 This beautiful, well presented apartment is in perfect location in which to explore the exciting city of Bath and its many attractions. Leave your car in the allocated secure garage, and walk to the many popular tearooms, pubs, and restaurants on your doorstep. With the theatre close by, and world famous spa's in the area you are spoilt for choice during your stay. For holidays taken between 9 April 2019 And 30 April 2019 Minimum of 2 nights booking. For holidays taken between 1 May 2019 And 31 May 2019 Minimum of 2 nights booking. The apartment was lovely, really clean and comfortable, it was Christmas and the sitting room had some lovely Christmas decorations. The welcome hamper was most generous. Sarah, the housekeeper, was so efficient and helpful, good concise instructions and offered us an early arrival time. Parking worked really well , I would thoroughly recommend this apartment. We are delighted that The Royal Crescent Apartment was lovely for your pre-Christmas break and thank you for your recommendation. This was a beautiful apartment with all amenities provided. A lovely food hamper was waiting for us on our arrival. Everywhere was clean and there was a beautiful private garden. The building was steeped in 250 years of history and was a great base for our visit to Bath. Great location and it's a nice feeling leaving the front door - one very minor point it's worth letting people know that the access stairs are quite narrow; they are quite a challenge when you're carrying a large suitcase. Great place, great service, nice care package on arrival. Thank you. Thank you for your lovely review. We are delighted that you were pleased with the apartment. The new housekeeper was very helpful, and presented the apartment very well,all immaculate. Lovely property. Housekeeper excellent, very helpful. Our housekeeper was great but the apartment was poorly maintained. We only had enough hot water for 1-1/2 showers per day, until we figured out that the owner had the system set to heat water in the morning. Also the bathrooms both needed updating and the furniture was tired and worn. Location - excellent; kitchen excellent; room size - excellent; bathroom linen - excellent - the White Company. Access - poor; hand basin taps - poor; shower room - fan not working, shaver socket not working. 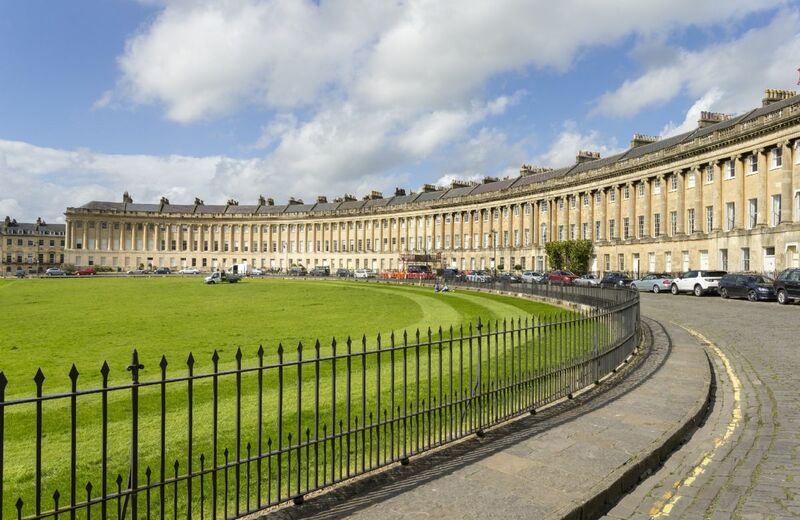 This luxuriously appointed apartment offers accommodation on one level in the centre of the famous World Heritage landmark, The Royal Crescent in Bath. Overlooking private lawns and the Royal Victoria Park, it is in an exclusive residential area. Excellent location, beautiful house, and great accommodations, highly recommended, so much better than staying at a hotel. Loved this house. It looks like it has just been renovated, everything super clean, neat as a pin and stylish. The location is the best in Hereford – right opposite the cathedral and really close to shops and restaurants. Beds are wonderfully comfortable with cloud-like duvets. Enjoyed the foosball. The stairs to the top floor are a bit scarily steep, but that's old buildings for you. Pay heed to the warnings not to park outside – the traffic wardens are on the ball and this is a no-stop area; even police cars have been ticketed here. The Sunday-morning cathedral bells were fabulous – clearly heard but not so loud they were bothersome, a call to prayer that we heeded (for the first time ever for some of us) and attended the last part of a beautiful service with a live choir. Fantastic experience! Would highly recommend this place. Thank you so much for such a wonderful comprehensive review and recommendation. The house was everything we could have expected. It was impeccably maintained. We had some questions upon arrival which were answered immediately by the Rural Retreats staff. The entire week was incredibly pleasant, we look forward to visiting again soon! Fantastic location which we made full use of with visits to the cathedral, garden, Mappa Mundi and chained library. We had no car but could walk to all of central Hereford and train station plus there was a nearby bus stop. The house was very clean with a generous hamper which made for a good start! As 3 single people it was lovely having the space to spread out and each with their own bathroom. We enjoyed watching a couple of DVDs on the larger television downstairs and in the kitchen there was all the equipment we needed. Christine was helpful and very friendly - and we had perfect weather so an excellent week's break. Thank you. Lovely setting right opposite the cathedral. Furniture and fittings were of a very high standard. Just one tip - the cathedral's bells chime on the hour and every quarter day and night - so it's best to know that in advance! Truly excellent location, well appointed small house, helpful housekeeper. Perfect location with views of the Cathedral from the front of the house. 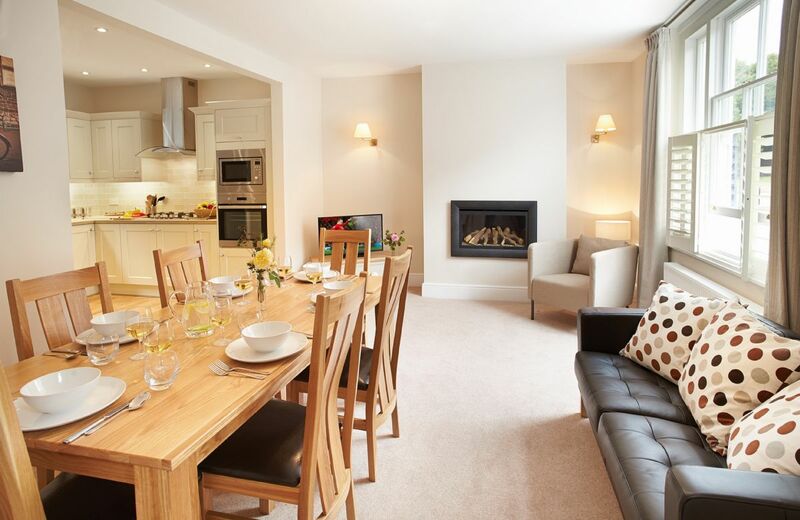 Immaculately clean with great use of space for families and friends to enjoy a wonderful and relaxing stay. The house was close to the cathedral, pleasant surroundings, restaurants, shops, museums etc yet was peaceful. It was warm, well equipped, pristine, well organised, safe and tastefully decorated. Beds were very comfortable with quality bedding, shower/ bathrooms excellent, good toiletries. Housekeeper was helpful and easy to contact and arrival hamper most welcome as it was snowing. just about everything necessary for a comfortable stay had been provided. House beautifully presented with all the amenities we needed. Clean, well looked after and lovely welcome hamper. We will be using rural retreats again! Thank you! House was just as described. Clean and well looked after. Customer service was excellent: friendly and helpful. The welcome hamper was amazing. Really useful when arriving with small children to have instant food and breakfast the next morning without having to shop. Lovely, house, lovely location, lovely service from Christine. Disappointed by the bathrooms: huge damp patches on the lounge and master bedroom ceilings; showers without fitting doors/curtains. the whole party ended up using the master en suite for fear the ceilings would collapse! Lovely house with every modern convenience. Beautiful aspect with the view of the west elevation of Hereford Cathedral from the ,iving room window. Fabulous hamper of goodies ion arrival. Just perfect. Lovely property, spotless, everything you would want in a holiday home. absolutely amazing. incredibly clean. and a perfect location. Superb house, very clean and in good condition, the games room absolutely made our holiday! The only downside is some noise during the night. Beautiful house, lovely location opposite Hereford cathedral, and handy for shops, restaurants etc. Welcome hamper on arrival was much appreciated. House was immaculate. Loved the games room in the basement. Thanks to Christine for making us so welcome, and thanks to Rural Retreats. Will definitely book with you again. 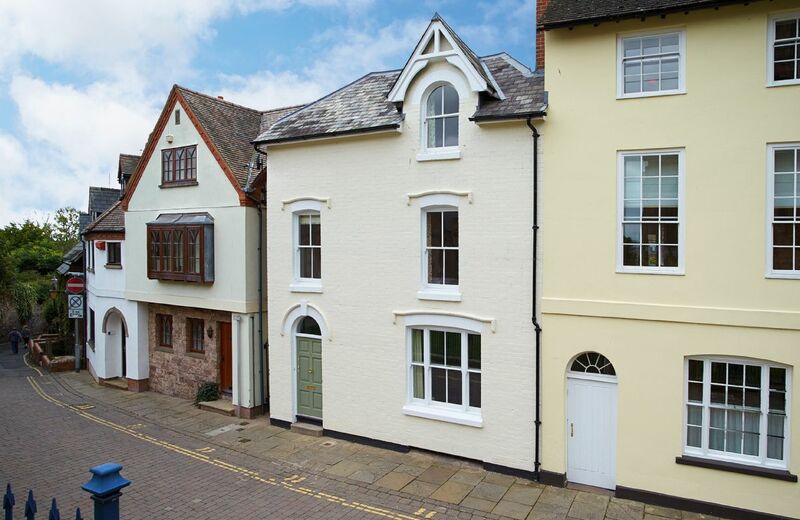 This four storey town house is in the heart of the city of Hereford. It has views of the Cathedral’s spectacular West Door and cloisters from most windows. It is just a 2-3 minute level walk from fine restaurants and boutique shops. For holidays taken between 22 April 2019 And 30 May 2019 Minimum of 3 nights booking. For holidays taken between 6 June 2019 And 30 June 2019 Minimum of 3 nights booking.